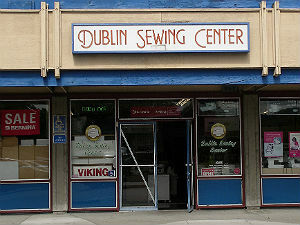 Dublin Sewing Center has been in business in Dublin, California over 32 years. We are a multi-line sewing machine, serger, and sewing furniture dealer. We offer sales and service of Babylock, Bernina, Pfaff, Viking and Elna sewing/embroidery machines and sergers. We sell Horn, Koala and Tailormade sewing and serger cabinets. We are also located in the Jo-Ann Fabric in Fremont on Boscell Rd. We offer an extensive line of classes and clubs that cover sewing, serger, machine embroidery, quilting, machine felting, and software. Please check the website under classes to view our current offerings .